I have always loved festivities. They spell cheer, colour, glee, love, neat décor, good food, new beginnings, some-sweet-things to sweet nothings and so much positivity. Only second to vacations, most great memories too are made during these times. What they also bring out for most is the best from their treasures! This festive season, Patty has given me the opportunity to begin sharing stuff from my treasures. Thank you Patty and am truly thrilled to be onboard. Talking of new beginnings, I would like to share with you one of my favourite creations this season. 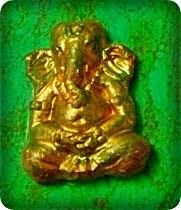 The Ganesha pendant. 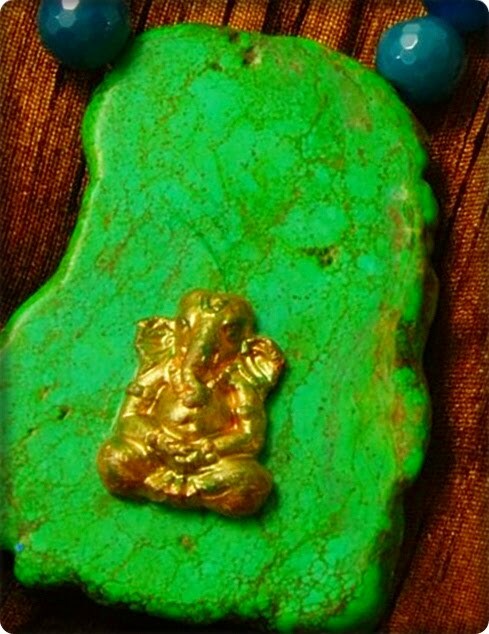 I beaded a green turquoise slab along a line of faceted blue agate and toyed with a zillion ideas to portray Ganesha on the slab. That is, until I ransacked my treasure box for matte gold paint (had settled to paint one on it) but instead, found these tiny clay Ganeshas my sister sent me 2 years ago, bottled away and forgotten amongst other trinkets. 'I was delirious' is an understatement and so didn’t waste a minute before I settled him on the slab and touched him up with a few strokes of translucent green paint to come up with this. …which now looks like this and has been bought off by a really dear friend to add to her treasures. P.S: E-mail me on harshidakoju@gmail.com if you wish to own any of my treasures which are now showcased on ‘Harshi Creates’ at Facebook. Thanks for the visit! Wishing you a happy festive season as well. Harshita, that necklace is gorgeous. Hope to see more of your work in this space! Harshi- Awesome Post!!! You are a creative genius! This piece is FABULOUS and I am soooo glad that it is going to someone who knows its value. Wishing you never ending creativity. Harshita, that blue and green necklace is beautiful! Awesome to see your work here...off to check your FB page! wow, this is gorgeous. I am a fan!!! 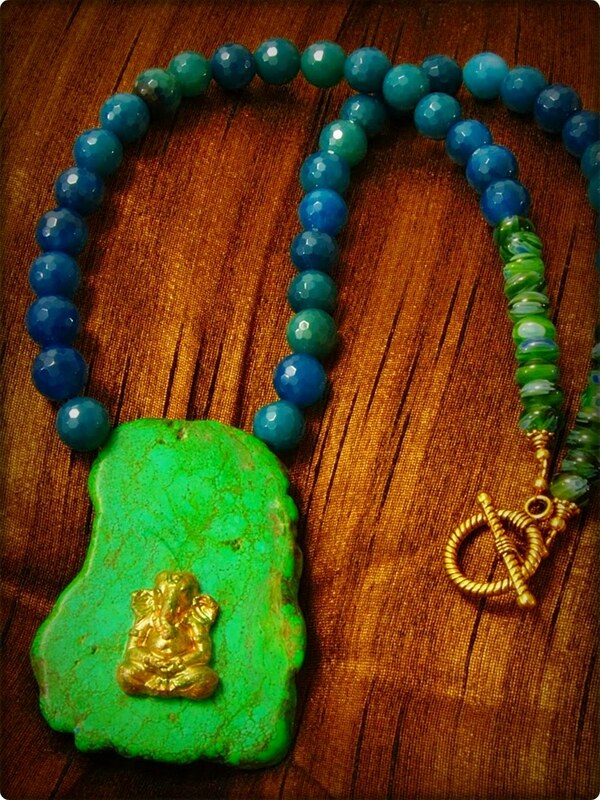 The blue green nacklace and the pendant are stunning. It is beautiful! It is an awesome creation, will make the wearer stand out in a crowd! Here's to many more posts and may you never stop creating. Hi Harshi!!! Am so so so proud to see your creativity splashed all over the net!!! Yipee!!! Keep up this gorgeous work!!! Love you!!! Wow Harshi! You are SO talented. I love the colours. I'm off to check your FB page. A learning curve - Pree's event!